STAR RECIPE WINNER – for June 2012 is Mama Cook with her recipe for : Spanakopita (spinach and feta pies) for the whole family. Congratulations. Apologies for being a couple of days late with the start of the linky. Funky Foodies is a monthly linkie, which will be opened on the first day of the month and will close on the last day. 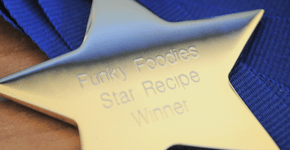 A medal will be awarded for the Star Recipe every month, and the fabulous trophy in the blog badge will be awarded at the end of a whole year of the Funky Foodies. If you want to find out more about it, read here. All you have to do is share as many recipes from your own blog a month as you’d like. If you struggle to add your recipe, send me your link and I’ll add it for you. Try to pop around and share the comment love with other funky foodies. We all like a little love and might come across some fabulous recipes. Simply add the link to your recipe on your own blog, and share your latest recipe with everyone taking part. If you don’t want to miss the linkie being opened, subscribe to RSS or by email in the blog header. I’ll add recipes of mine to share, although I don’t count in the recipe challenge. Feel free to copy the badge or use the html in the widget at the bottom of the page to add the small blog badge to your own blog / post. It makes finding you easier for other funky foodies. If you want to add the July blog hop to your own recipe, get the InLinkz code and add to the html. Oops, added a link, but did it somehow wrong. However, you can call the recipe Chris, if you like. Nice to be here anyway! I was about to add the code to my latest post but it’s the June code not the July one? Hmm that was meant to say Pork Burgers with herby wedges, not Recipe Junkie. Still, hope you like the recipe! Oh I just found you this evening – what a great linky. I wasn’t sure if it needs ot be original recipes – i have plenty to post but I was keen to link up anyway so if my contribution this evening doesn’t count, no worries! I’ll be back with more! Hello! Just added a recipe to the linky! It’s always nice to stop by and have a read here! Your photographs are lovely, don’t be shy. Thank you!!!!!!!!!!! You’ve made my month!!!!!! You’re welcome, it was a lovely recipe..
Hello, I’m new to your blog, what a fantastic win from Mama Cook last month – hungry now!